It hasn’t gotten too much attention outside of talk radio, but if accurate, Gallup’s study of early voters neutralizes one of the Obama campaign’s best road-to-victory talking points. As it conducted tracking polls (which have been paused for now), Gallup asked voters whether they’d cast ballots or intended to before election day. The early voters broke 52-46 for Mitt Romney. The dawdling voters who would vote before election day were tied, 49-49. 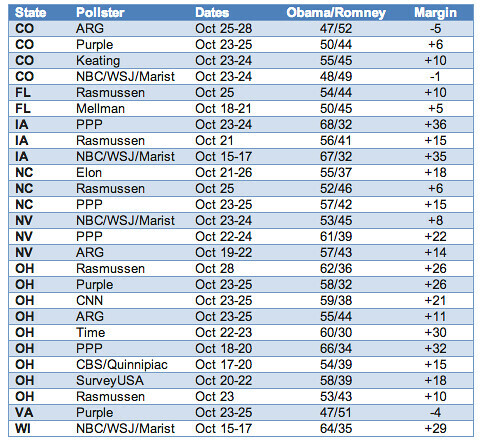 The voters waiting for November 6 broke for Romney, again, by a 6-point margin. This would be easy to explain away if Obama had lagged in 2008’s early vote. After all, this study includes votes in Georgia and Texas and other places that have broken away from Obama. But… in 2008, Obama was winning this vote. An identical Gallup study taken around the same time gave Obama a 53-43 lead with early voters and a 50-44 lead on voters who would wait for election day. I’ve asked the Obama campaign to explain what Gallup might be missing, and will update with any response, but what response would explain this? UPDATE: But this is just Gallup. The Obama campaign has kept up an early vote blog, offering new numbers from the states, and it makes a good case that it’s held its swing state lead. This, according to polls, is the range of the possible early vote lead. And obviously, stronger Romney early votes in Texas don’t affect any of this.